IFTAR GUESTS: Around 50 people were at Howden Clough Community Centre for the meal. Members of the Ahmadiyya Muslim Association in Spen Valley organised a community Iftar at Howden Clough Community Centre, Batley, on Saturday (2 June). The Iftar (breaking of the fast) is the meal eaten by Muslims after sunset during the holy month of Ramadan. They were joined by Rev Lesley Mattacks from St Saviour’s Church, local community and charity workers, friends and family and local members of the Ahmadiyya Muslim Association in Spen Valley. After the recitation of a portion of the Holy Quran, explaining the purpose of fasting, Arif Ahmad, president of the Ahmadiyya Muslim Association in Spen Valley, thanked all the guests for attending. He stated that the purpose of the Iftar function was to share the joy and blessings of Ramadan with close friends in the community. Regional missionary, Imam Sabahat Karim, explained that some form of fasting was found in all religions and that it was a way of purifying one’s soul and bringing yourself closer to God. Charity is an important part of Ramadan and Muslims are encouraged to be more charitable during this month. Tracy Brabin stated she had attended a number of Iftar functions, small and large over the years, and that she was delighted to be attending the event. 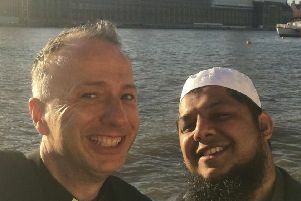 Rev Dr Martin Naylor said that he valued the friendship his church had with local Muslims and that, despite theological differences; they were all working together for the common good. Aiden Hatfield, who had never attended an Iftar before, said he was delighted to be invited even though he was not a religious person. He was also grateful for the opportunity to meet new people and to discuss the working he is doing to counter the stigma of depression and mental health. At the end of the function Rev Lesley Mattacks said that she would like to learn a Muslim greeting. Arif Ahmad explained the meaning of Assalam-Alaikum (“May the peace and blessings of Allah be upon you”) and Walaikum Assalam (“And unto you be peace”). He said that the Christian greeting of “God Bless You” was very similar to the Muslim greeting.